There’s no need to be daunted by the challenge of decorating a large wall. Learn how to turn a large wall space into a powerful design statement. If you’re wondering, “What are some good ideas for decorating a large wall space?” you’ve come to the right place. Decorating large wall space areas can be one of the most challenging but also one of the most fun interior design projects you can take on. Because what you can do with a vast expanse of wall is limited only by your imagination, you can get delightfully creative with big walls. Here are seven large wall space ideas to give your wall decorating inspiration a jumpstart. The most obvious solution for a big wall is big art. Hanging a huge painted canvas can be the ideal partner for a massive bare wall. Better yet, if you’re artistic, why not make the wall itself your canvas? Create a mural for your wall. Or if you’re not creative, hire someone to paint a mural on your wall. Big art, whether it’s on a canvas or on the wall itself, can vary from simple abstract shapes to graffiti-like modern words and cartoons to realistic images of a vast countryside. 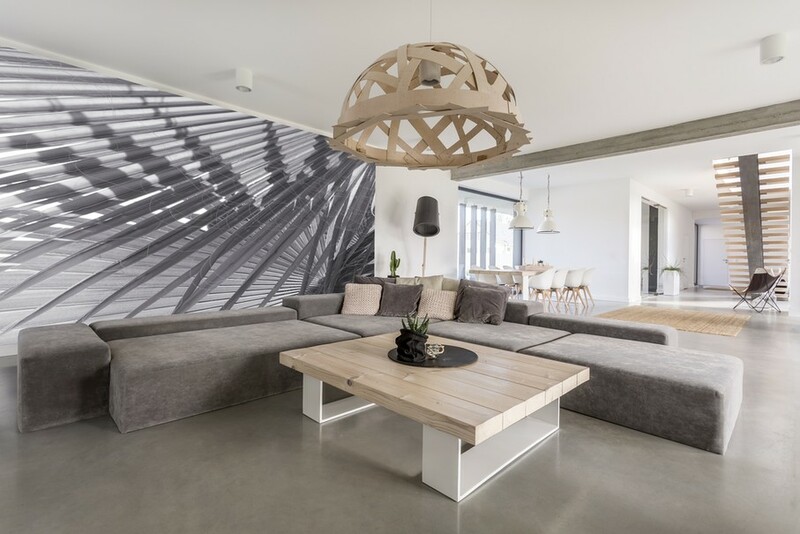 Turning an entire wall into art creates a powerful focal point in a room. The first thing that comes to mind when thinking about decorating a wall is wall art: prints, photos, and paintings. The reason large walls are daunting is most of us don’t have large prints, photos, and paintings. 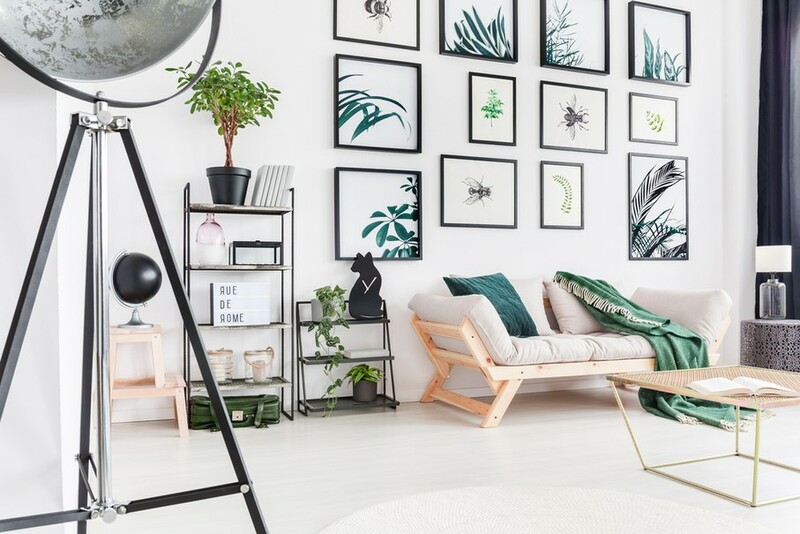 If you don’t want to go out and buy a large art piece for a big wall or you don’t want to have a mural done, you can use your smaller wall art if you combine it in such a way that it becomes one large installation. For example, two medium-sized paintings or prints that mimic or mirror each other can be hung side by side in a big space. Or you can combine a variety of art sizes and styles in one large gallery wall. 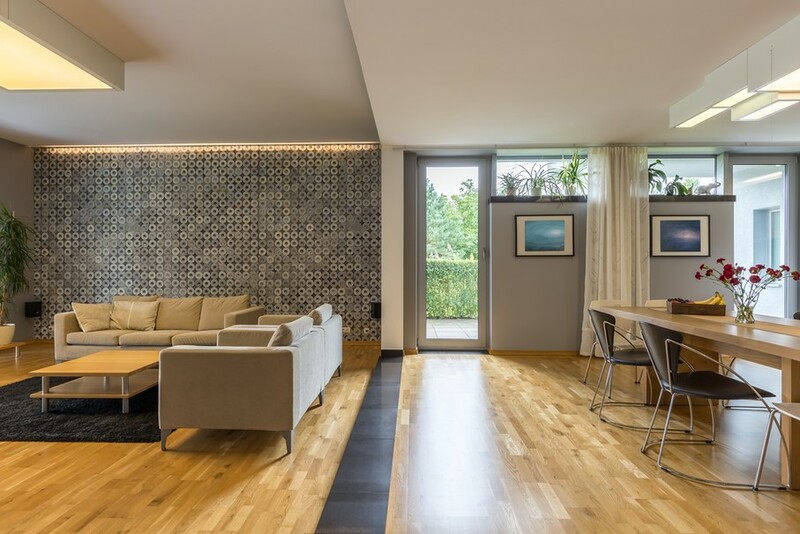 A gallery wall is one of the best answers to how to decorate a large living room wall. Decorating a large wall becomes easy when you start thinking beyond art and photos. All sorts of objects can be hung on your walls. From blanket-sized textiles to tree branches to baskets to hats to sporting equipment to … well, the possibilities truly are nearly endless. When covering a big wall with something other than art, don’t just willy-nilly throw stuff up on the wall. Follow these two rules to create cohesive and beautiful large wall decoration. Be sure what you put on your wall fits with the room’s purpose and design scheme. Plates, for example, would look fine on a big dining room wall. They might look a bit weird in a bedroom. 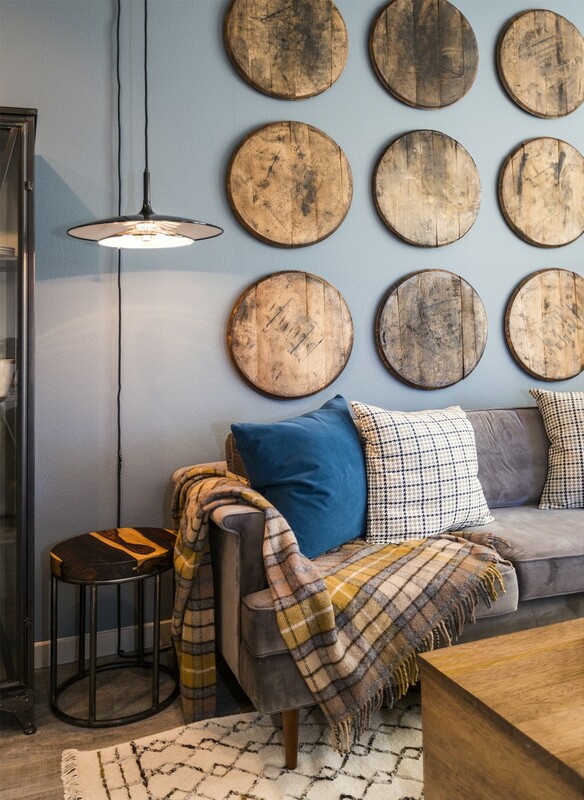 Rustic wall items don’t belong in modern rooms. Shiny modern wall items don’t fit in romantic or country rooms. I’m sure you get the idea. When you’re hanging your items, think in terms of creating a collection or a pattern. Rows, for example, can turn objects hung on the wall into an almost 3D wallpaper effect. Plants can be an easy way to fill up a large wall and enliven a space. A living wall of plants, for example, can be commanding large wall décor. If you’re not up for that project, however, there are easier ways to cover a wall with plants. You can either group together trees in large planters, or you can cluster smaller plants on wall brackets, shelves, or on other furniture to create a wall of plants or a “living wall.” A wall filled with plants can be a fit for any décor style as long as what the plants are sitting on blend with the other design elements in the room. One of the easiest answers to how to decorate a big wall is to fill it with furniture. A large bedroom wall, for example, would be ideal for a commanding headboard. Built-in furniture or shelving can be used in any room in your home. In the living room, for example, a set of built-in shelves and cabinetry can be combined with a large screen TV to decorate one whole wall of the room. Sometimes the best way to decorate a large wall is to turn the wall into a form of sculpture. You can do this with textured or 3D wall treatments. 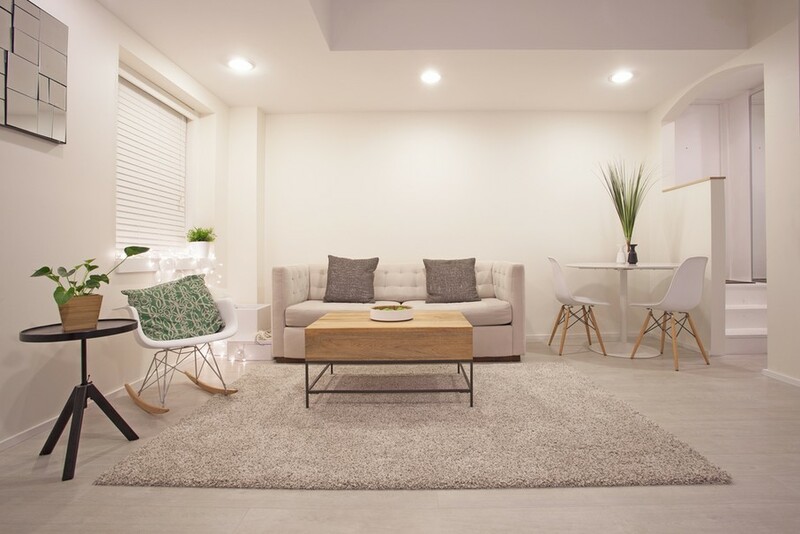 These treatments, which can be constructed from anything, including wood, plaster, stone, metal, and plastic, create so much depth and interest that they remove any need for even the thought of hanging something on the wall. Brick, stone, and reclaimed wood are excellent textures for rustic or traditional spaces. Metal and plastic work best in modern rooms. Sometimes the simplest solution is the best. And sometimes a bare wall just needs to be … bare. In modern minimalist design, less is more. This means bare space is a design element in and of itself. Decorating a bare wall with nothing works best in relatively monochromatic spaces. The empty wall becomes a form of “art” that connects other similar hued objects. So decorating large wall space areas isn’t as big a deal as it seems, is it? 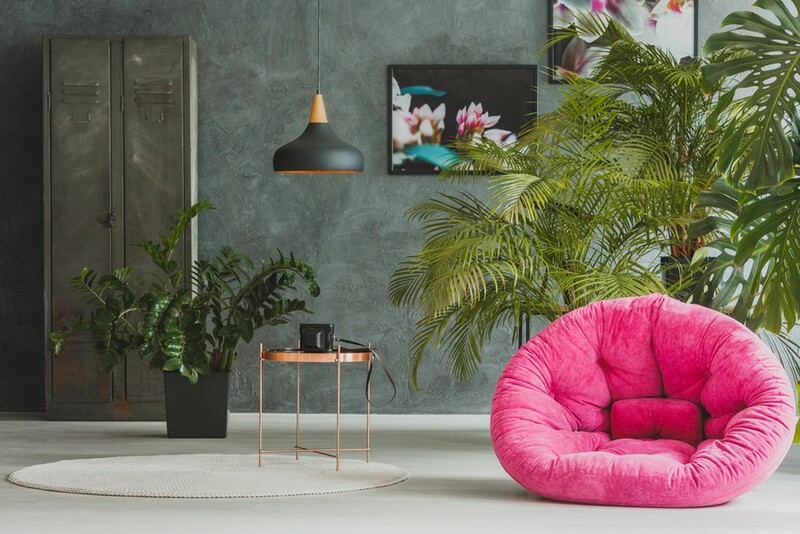 Armed with these ideas, you can now look around your space and let it suggest its own innovative ways to turn your big walls into a big design impact.